The Definition of a Southeastern Indian--Is There Such a Thing? A couple months ago, I participated at the shootout at the Swamp Safari. We have been doing this event since 1999. I was at the first one, although I have not been able to make it every year. As always this year, the host, Jay Osceola, was generous and helpful, and I enjoyed it. Jay has been a great host! Due to ongoing health issues, I could not stay the whole event, but think I did well for being there Friday and Saturday. At least I did not have to go to the hospital afterwards, which happened a couple years ago. I cannot run around like I did 30 years ago. Myself at the Swamp Safari. The only unpleasant experience at the event, was when I wandered out to the modern vendors outside the front gate. At one booth, I was berated, insulted, and cussed at by a guy who thought that I was too white, and had no business admiring and adopting any of the Native American culture. I don’t think this guy is a member of the Seminole Tribe, but I have seen him at tribal festivals. This person obviously had a prejudicial attitude about me without even knowing who I am. He judged purely by outside appearances and stereotypes. I would hope that he would strive to be a True Human Being and judge by the heart and the soul instead. His main items of sale in the booth were dvd movies, and maybe he is just blaming me for declining sales of an item that has almost disappeared like vhs cassettes. I do not see that as very good business plan, besides insulting potential customers with racial insults at festivals. I have seen him do the same before at other events to other people. This brings to light a conflict that has existed among the southeastern tribes for the past 200 years. What we know as the Five Civilized Tribes; Creek, Cherokee, Chickasaw, Choctaw, and even Seminoles, do not always fit a standard racial appearance. Saying that someone does not look Indian is not a valid argument. These tribes have been inter-marrying with the settlers, slaves, and soldiers since the Spanish landed here. As mentioned in John Ellisor’s recent book on the Second Creek War (2010), the Creeks being removed from their home in Alabama had a multi-ethnic appearance as written in many eyewitness and contemporary accounts. They looked anywhere from your tanned and more aboriginal looking Indian, to white land owner, to black farmer. It was truly a diverse society of multi-ethnic backgrounds that lived in close proximity to each other. This made the removal difficult for those who were not removed, because they saw people who looked just like themselves being taken away. The Cherokee were the same way. I have seen a lot of blonde or red haired Cherokee and Chickasaws. 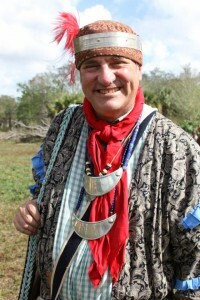 And I have even seen one or two Seminoles. I know a fluent Muscogee speaker in northern Florida, who may be the last, and you would not be able to pick this person out in a crowd from anyone else. So skin pigment and outward appearance are not determining factors for being Native American Indian. Years ago, I met a very attractive blonde Apache girl! But the argument of what exactly is a Creek, Cherokee, or Seminole, has gone on for the past 200 years. It was a big issue during the Creek War of 1813-1814, when you had traditional Red Sticks on one extreme, and white Creeks who owned land, slaves, and all the appearances of white plantation owners on the other side. Look who we have from history that show this: William Weatherford (known as Red Eagle) was red haired. First Lady Abigail Adams told Alexander McGillivray that if she had not known that he was Indian, she would not have been able to tell. And looking at his portrait, he is no different from myself. 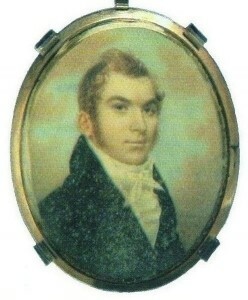 I found his portrait on Wikipedia (below), and I would guess that is the same one I saw in the Creek Council House Museum back in 1997, which was made when he was alive. His father was Scottish, but he certainly took the opportunity to make himself self-proclaimed chief and co-owner of the large Panton-Leslie trading monopoly in the southeast. Last month the Fort Lauderdale newspaper ran a series of articles about the traditional Seminole-Miccosukees who live in south Florida, who are not members of either federal recognized Tribe. They are said to number about 100, but there is probably no way to verify that. According to their beliefs, anyone except themselves are sell-outs, and they are the only true traditional carriers of history and tradition. This narrow view held by a minority of the population of the tribe, of who are the true members of the tribe, or who are God’s chosen, is not uncommon. Every society all over the world has such a small minority that make similar claims. It the newspaper story, it told of one of the women among the non-recognized Seminole-Miccosukees who had married into the small group but was an enrolled member of the Miccosukee tribe. Enrolled because it was a decision made by her parents and not her. But since she is an enrolled member, her married family of the non-reservation folks say that she is not among the elect and automatically going to hell for being enrolled in the tribe. This is unbelievably cruel to tell anyone, and is just wrong. It is religious extremism. These are the Taliban of the Seminoles-Miccosukees. Now, I am not all against what these non-enrolled & non-federally recognized people profess. I love their fight for environmental issues and clean water in the Everglades. This is a fight that will affect us all. And I am in total agreement with them about clean-up and restoration of the Everglades. And I hope that they can just live their lives the way that they want without interference. If they can be left alone to do what they want, then that would be great. But assuming that someone has to fit a narrow criteria to be Indian is just being prejudiced and is an unacceptable attitude. The southeastern tribes are very racially diverse and have been that way since the Spanish arrived. But this is an argument that is still going on, even among the tribes themselves. Maybe we could also call this attempted ethnic cleansing. But history proves that it will not go away; change is always happening. And their demand that Clewiston, Naples, or all development in south Florida just disappear, will not happen either. Maybe if everyone realized we were all in this together, then maybe we could get some really great environmental legislation passed before all the water in Florida is poisoned or everything is choked out by exotic plants and pythons.